This prompt comes from Amy Johnson Crow at her blog, No Story Too Small. She suggests we write once a week about a specific ancestor. I began with my grandparents and am working my way back in time. Charlotte Temple Ott was the daughter of Jacob Ott III & Margaret Jackson. Her siblings were: Isaac, Charles, Jessie, Naomi, Sarah, Samuel & Jacob. In 1835 Charlotte Temple Ott married Nathaniel Brumfield., They had five children. In 1840 & 1850 they were in Washington Parish, LA where Nathaniel was a farmer. In 1850 Nathaniel was one of the top rice growers in the parish. Two years later, Nathaniel died. Charlotte had five little children to care for and a farm to run. She married Nathaniel’s brother, Elijah Brumfield. Charlotte & Elijah had two daughters together. They stayed in Washington Parish, LA. In 1860 Charlotte & Elijah had six children on their farm. In 1860 Elijah had 35 slaves. In 1863 the Elijah Brumfield family had three girls in school in the 6th school district in the parish. Two other sons, Jessie Alexander Brumfield & John D. Brumfield, both served in J H Wingfield’s Regiment, LA Calvary. Fortunately, they returned home safely. In 1880 Charlotte, once again a widow, was still in Washington Parish, LA. Son, John D. and daughter, Angeline, were both living with her. Charlotte died c 1895, having lived her life in Washington Parish, LA. Randolph, Ruth Brumfield, and Nell Brumfield Jacobs Smith. 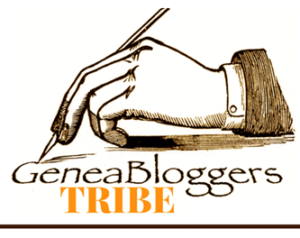 Brumfields Revisited: Ancestors and Descendants of George Y. and Martha Penny Brumfield. Privately printed, 1995. Williams, Jr., Ernest Russ. A Potpourri of Historical Data concerning the Founding Families and Individuals of Washington Parish, Louisiana, 1798 - 1860. Monroe, LA: Northeast Louisiana University. 1860 US Census, Washington Parish, Louisiana. Elijah Brumfield family. Kerns, Gloria Lambert. Washington Parish, Louisiana Records, 1810 - 1898. Baker, Louisiana: Folk Finders, 1983, Page 23. US Bureau of Census, Washington parish, LA; 1860 Slave Schedule. Elijah Brumfield. Kern, Gloria Lambert. Washington Parish, Louisiana Records: 1810 - 1898. Baker, Louisiana: Folk Finders, 1983. Williams, Jr., E. Russ. History of Washington Parish, Louisiana 1798 - 1992. I. 1994. 976.311. Martin P Brumfield member of' Washington Rifles/ Company I, 9th LA Infantry, Confederate States of America"
 Compiled Service Records of Confederate Soldiers who served in organizations from the State of Louisiana; NARA; digital images on fold3. 1880 US Census, Washington, Louisiana SD 1, ED 194, Page 35; Charlotte Brumfield. This week’s Sepia Saturday photograph focuses on signs on buildings. It reminded me of two family photos that were taken c 1925. 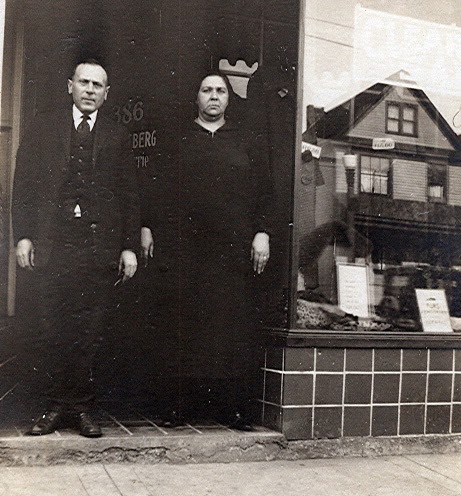 This Fur Store was owned by Frank Samuel Weissberg, son of Morris Weissberg & Rose Bankin, and Florence Gartner, daughter of Leopold Gartner and Fannie Edelstein. Florence was my Grand Aunt, sister of my maternal grandfather. Frank was born in Austria and Florence was born in New York City where they met and married on 27 January 1907. By 1910 they were living in Buffalo, NY. The 1925 New York State Census shows the family at 386 Grant Street, Buffalo. Frank was a furrier. This is the location shown in the photographs, as evidenced by the signs. I am very happy they took the time to pose in front of their store with the signs behind them. 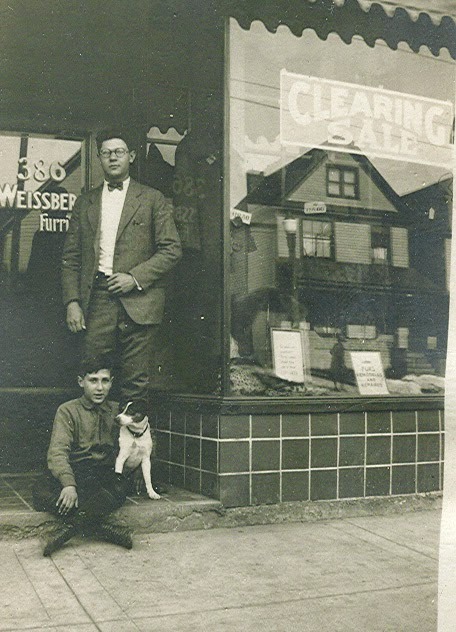 Frank & Florence then posed their sons and even the dog in front of the store. I went to Google Maps to find the same building today. However, it is just an empty lot. 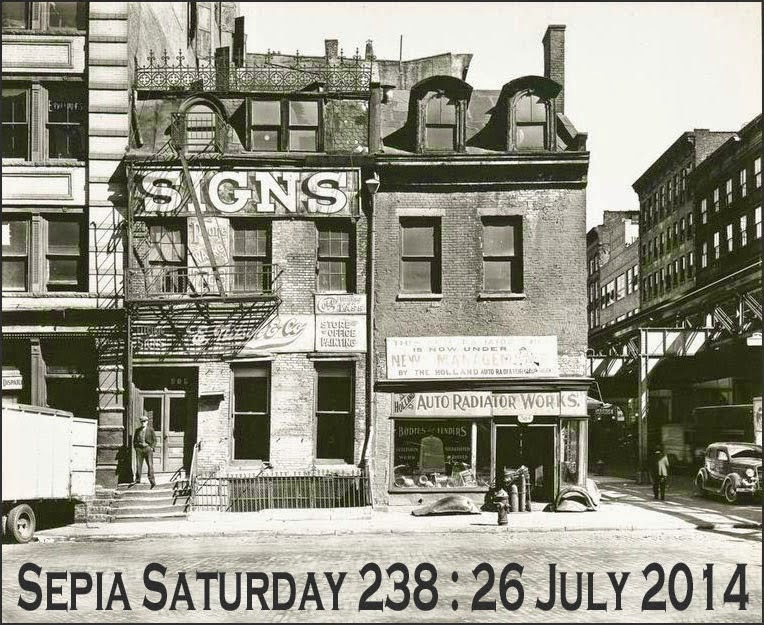 Be sure to take a peek at the other photos posted for Sepia Saturday this week. Certificate of Marriage for Samuel Weissberg and Florence Gartner, 27 January 1907, #2933, State of New York, City of New York; New York City Department of Records, Municipal Archives, 31 Chambers Street, New York City, New York. 1910 United States Census, Buffalo, New York, SD 14, ED 48, Sheet 6A; Samuel Weissberg family on Walnut Street in Buffalo. 1925 NYS Census, Erie County, Buffalo, AD 4, ED2, Page 30; 1 June 1925. Frank S Weissberg family at 386 Grant street. Casey, A. E. (2001). Amite County, Mississippi, 1699-1890.Volume 3: The Environs. Greenville, SC: Southern Historical Press, Inc. (Original work published 1957). When is the last time you had a new resource to explore: a new map, document or book that you were anxious to look at closely? This book just arrived at my doorstep and I an full of happy anticipation. Some of my families lived in Mississippi: Alford, Brown, Brumfield, Dillon, Fortenberry & Smith. They lived in Amite, Marion, Pike & Walthall counties. 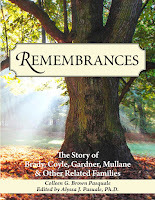 Potentially this book could have information on any or all of those families. It could be filled with important pieces of the puzzle OR it could have just a clue or two OR it could be that I can't connect any of the data inside to my family at this time. However, before I even open the cover, I am hopeful & full of anticipation! In 1835 Nathaniel married Charlotte Temple Ott, daughter of Jacob Ott III & Margaret Jackson., In 1840 & 1850 they were in Washington Parish, LA where Nathaniel was a farmer. In 1850 Nathaniel was one of the top rice growers in the parish. "Nathaniel Brumfield produced 37 bales of 400 pounds each (along 4,000 pounds of rice and other foodstuffs) on 200 acres of clear and cultivatable land with a work force coming from his 24 slaves." Nathaniel was only 39 years old when he died. His wife had five little children to care for and a farm to run. She married Nathaniel’s brother, Elijah Brumfield. Nathaniel had a short life but through his children and theirs his line continues. Pedigree Chart for Roy Brown; 1700's to 1948; Compiled by Zelda Marie Alford Fortenberry. Conerly, Luke Ward. Pike County Mississippi, Pioneer Families & Confederate Soldiers, 1798 – 1876. 2008 Edition. Madison, Georgia: Southern Lion Books, 1909. "Lula Brumfield, daughter of W. J. O’Quin and M. E. O’Quin was born Dec. 15, 1878, and was married to H. J. Brumfield, 1896. United with Centerville Baptist church 1894, where she remained until her death March 20, 1909, leaving a husband and five children; father and mother, five brothers and one sister." From: Williams, E. Russ. Abstracts of Obituaries from the Minutes of the Magee's Creek Baptist Association (Mississippi and Louisiana), 1882 - 1924. Monroe, Louisiana: Privately printed, 1978, page 72. From the Louisiana Archives, Baton Rouge, LA. Euseba Fortenberry was the daughter of William Jasper Fortenberry & Violette Kennington. Her siblings were: Gasua C., Calvin C., Isabella, William J., Olevia, Burrell T., Alfred, Hollis & Willis J.
Euseba married Wyatt Smith, son of Jeremiah Smith & Joanna Dillon. They lived in Pike County, MS where they raised nine children. Son, Rankin b c 1844, was not listed in the 1850 census. He may have died before then. Unfortunately, Euseba knew great sorrow in her life. Three of her six sons died in the Civil War. The first to die was Newton Oscar Smith who died 4 May 1862. He was only 20 years old when he died of typhoid fever. 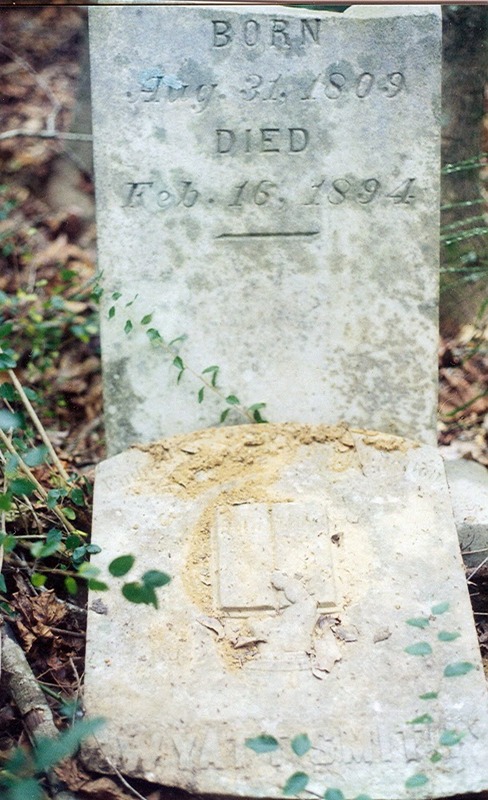 A month later, William J M Smith died 4 June 1862 at the age of 26. The next month there was another death. Jasper R Smith died 10 June 1862. Her youngest sons were too young to serve in the war. Adolphus S Smith went on to become a dentist. Walter Lorraine Smith followed his father’s footsteps and was a farmer. Euseba’s three daughters all married and had children of their own. Hopefully the births of her grandchildren helped ease the sorrow from the losses she endured. The Wyatt Smith cemetery is not easy to access. There are trees, shrubs and weeds in a big tangle around the stones. Wyatt and Euseba’s stones are broken. Euseba’s name is missing from the top of her stone. It just says, “Wife of Wyatt Smith” with the dates. Criminger, Adrianne Fortenberry. The Fortenberry Families of Southern Mississippi. South Carolina: Southern Historical Press, 1984. Confederate Service Record; 1862; Mississippi Department of Archives and History, Archives and Library Division; N. O. Smith. Private, Company H, 7 Mississippi Infantry. Creel, Bevin J. A Patriot's Legacy: The Family of Richard Dillon and Ann Lawrence from Bertie County, North Carolina To Southern Mississippi and Louisiana. Franklinton, Louisiana: Privately Printed, 2002. Confederate Service Record; 1862; Mississippi Department of Archives and History, Archives and Library Division; Jasper R. Smith. Private K Company, Mississippi Volunteers. 1910 US Census, Ward 2, Washington, Louisiana, SD 4, ED 125, Sheet 8A; Walter L Smith. Recently my emails were not coming through. I believe the problem has been fixed. 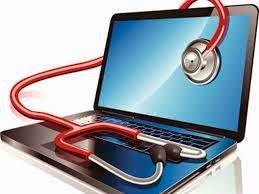 I'm sorry if you were not able to connect with me through my blog or email. A big thanks to my daughter and son in law who helped repair the problem. these books and the syllabus I am still learning more to improve my research, long after the conference was packed up. Salley, A. S. (2011). The History of Orangeburg County, South Carolina, from its first settlement to the close of the Revolutionary War. This book is useful for me because my Ott family was one of the early settlers to Orangeburg, SC. Melchoir Ott, my 7th great grandfather, b 1699 in Switzerland, arrived in Charleston in 1735, according to this book. The marriage record of his son, Jacob Ott I, to Margaret Fichtner is also included. There are several other records related to the Ott family. I had seen this book in libraries in the past and copied out a few pages. Now I have the full context to search for more clues to the past. I like to find historical books like this, originally written by someone who was more than one hundred years closer to those events than we are. If this area is of interest to your research, find a copy to read. Wyatt Smith was the son of Jeremiah Smith & Joanna Dillon. His siblings were: Hollander, Martha P., Eli, Jane, Edwin, Eliza, Calvin, Lidda, Mehala, Milevey, Joanna & Jeremiah. He married Euseba Fortenberry, daughter of William Jasper Fortenberry & Violette Kennington. In 1840 they were in Pike Co., MS with four children and 25 slaves. In 1850 they had seven children. Their farm was valued at $1,000. The 1860 census shows their location in Pike Co. as Holmesville. Neighbors included other Smiths, Fortenberrys and Ellzeys. That year Wyatt owned ten slaves and had two slave houses. "These two seemed to possess the traits of true democracy and that is 'work'. They blazed the trail, built the stockade a quarter mile east of the present Silver Springs Church. Besides rearing eight children of their own, they proved their love for children by bringing up several orphan children, and counted them their own." By 1870 the farm was valued at $3,000 and Wyatt’s personal estate at $1,400.Only two children were still at home. In 1880 Wyatt was living with his son Adolphus and family. Son, Walter, and family lived nearby. 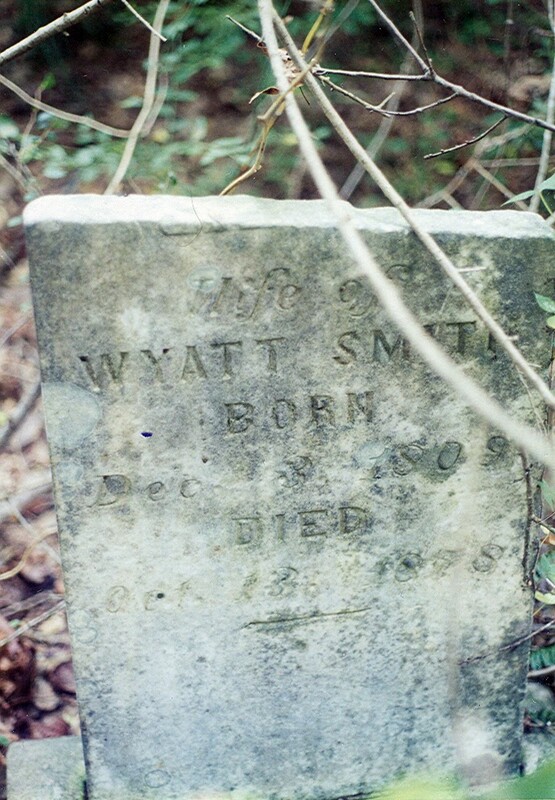 Wyatt is buried in the Wyatt Smith Cemetery in Pike Co., MS. Several years ago my family and I visited the cemetery. We had to go through private land to reach the cemetery. Trees and weeds were grown up around the stones. Wyatt’s stone is broken. The top half was lying on the ground, covered with dirt. I hope the stones there are still readable. Holbrook and Fressenden’s Stereotype Edition of the Holy Bible, Brattleboro, VT, 1825. Original owner: Jeremiah Smith Sr. of Pike Co., MS. Copied by Texana Carter, 27 August 1854. In possession of Mrs. W C Uhlman, Rte 6, Tylertown, MS, great granddaughter. 1840 US Census, MS, Pike County. Wyatt Smith family. 1850 US Census, Pike County, Mississippi. Wiatt Smith family. 1860 US Census, MS, Pike, Holmesville, page 149. Wyatt Smith family. 1860 US Slave Schedules, MS, Pike Co., Schedule 2, p. 51. Wyatt Smith. Fortinberry, G. K., Abstract History of the Fortinberry Family; 1795-1940's; Family History Center Microfilm #1036152. 1870 US Census, MS, Pike, Osyka, page 3. Wyatt Smith family. 1880 US Census, MS, Pike; SD 3, ED 37, page 58. Wyatt Smith family. O'Rourke, Helen L. Gone But Not Forgotten. Mississippi: Privately printed; Page 172; Magnolia Gazette, Reel MG 5. Pike - Amite - Walthall Library System, 1022 Virginia Avenue, MS.
 Parish, Ray and June Sartin. Cemetery Inscriptions Pike County, Mississippi 1750 - 1978. Page 633. Wyatt Smith Cemetery (John S. Ellzey Cemetery). "J. A. Brumfield was born Sept. 23, 1838, united with the Mt. Herman Baptist Church Oct., 1864, remained a member of the same until the organization of Bogue Chitto Baptist church, of which he went into the organization of, and remained a member of same until his death which occurred on May 23, 1914." Williams, E. Russ. Abstracts of Obituaries from the Minutes of the Magee's Creek Baptist Association (Mississippi and Louisiana), 1882 - 1924. Monroe, Louisiana: Privately printed, 1978, page 73. From the Louisiana Archives, Baton Rouge, LA. Vigil, Vicki Blum. 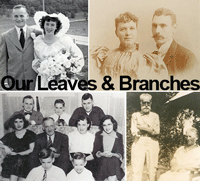 Finding Your Family History in Northeast Ohio. Cleveland, OH: Gray & Company Publishers, 2003. This is a great book that I use when searching for my Mark branches. I have 2 copies & would like to find a good home for this one. I cannot praise it enough for the information inside. If you would like this book please send me your name & address. If I do not hear from anyone I will donate it to my local library. The birthdate of Mary Polly Spurlock intrigues me because she was born on the first day of the new century. In her 88 years she witnessed many changes in our country. The year she was born the U. S. capital was moved from Philadelphia to Washington, D.C. When she was three the Louisiana Purchase almost doubled the size of our country and when she was 67 Alaska became a part of the US. Both the War of 1812 and the Civil War were fought during her lifetime. Presidents Lincoln and Garfield were assassinated. Custer’s regiment was wiped out and telephone lines were beginning to be strung. I am confident that, of all the changes she witnessed, the Civil War had the greatest impact on her life. I wish I knew more about Mary herself. Unfortunately, at this time I have no sources that lead me to learn about her parents or siblings. She was the wife of Edward Stewart Brown. In 1850 they were in Amite, MS with four children: twin girls, Mary & Martha, and sons Allen & James. Her husband was a farmer and their real estate was valued at $720. Ten years later, her husband had died and Mary was the head of the family. Still in Amite, MS, she lived with sons Allen & James. Their farm was valued at $2,000 and her personal estate was $9,000. Her son, James P Brown died in the Civil War. I am looking for details of his service. Mary was not with Allen and his family in 1870 or 1880. She may have been living with one of her daughters but, since I do not know their married names, I have been unable to find Mary. CENSUS 1850. Amite County, Mississippi. Roll M432-368. Lines 30--E. S. Brown. 1860 US Census, MS, Amite, Liberty; M653-577, National Archives. Mary Brown and children.